Fluffy, Light, Not a Potato in Sight! After taking every aspect of pastry into account I have concluded that Pâte a Choux is the Queen of all Pastries. Pâte a Choux is versatile and delicious in whatever form you find her. Eclairs, gougeres, cream puffs, Paris Brest, beginets. Whichever way she comes, I love her. I love making Pâte a Choux too. Harold Mcgee describes the technique for its preparation as tediously elaborate but I disagree. I become an alchemist in the kitchen when I make Pâte a Choux, giving thanks to the medieval chef who dreamt up such a peculiar way of combining a set of simple ingredients with magical results. You are probably most familiar with choux pastry in its baked form, when it has been popped into the oven where it transforms into a puffy golden shell. But did you know that the very same dough can be gently poached to produce the softest, pillow-like, adorable, little gnocchi too? Forget the potatoes! Next time you desire a creamy carb-fest for dinner, simply turn to your pantry for some basic ingredients and whip up a batch of these super-satisfying, eggy, smeary, filling, irresistable French-style gnocchi. Recipe below. Ooh la la! - Read through all the instructions before you start this recipe. - Line a couple of baking sheets with parchement paper and put them to one side. - Measure and sift the flour into a jug or other container suitable for quick pouring. - Have a wooden spoon at the ready. - In a heavy saucepan gently heat the milk, butter and salt until the butter is melted and then bring to the boil. - Take the pan off the heat and immediately pour all the flour at once into the milk and start beating all the ingredients together vigorously with the wooden spoon. - After about a minute the dough will come away from the sides of the pan and form a ball of sorts. When that happens you can stop beating. - If you have an electric mixer then put the ball of dough into the bowl of the mixer and leave it to cool for five minutes. If you don't have a mixer, a wooden spoon will suffice, tranfer the dough to a mixing bowl and rest those biceps for five minutes. - Whilst the dough is cooling, fill a large pan with water, salt it well and bring it to the boil. - Back to the dough. Adding one egg at a time, beat thoroughly to fully incorporate each one into the dough before adding the next one. Four eggs should be enough, but if you find that your dough is still very stiff and dry then beat in the extra egg. - The next stage is to transfer your dough into a piping bag with a large, plain nozzle. It is easier to work in batches. I split the Pâte a Choux into three batches when working with this amount of dough. - Adjust the pan of water to a gently rolling boil. Have a pair of scissors ready. In one hand hold the the piping bag and as you pipe the dough into the water, quickly snip them off into pillow shapes. The water will splash so if you have heat sensitive hands it might be an idea to wear protective gloves. - The gnocchi take about five minutes to cook and will be ready when they float to the surface. Remove them with a slotted spoon and lay them out to dry on the baking trays. Repeat the process for the reamaining batches of dough. The gnocchi will be good for a couple of days, refrigerated in this state, but they need to be baked with a sauce of your choice before serving. Bake in a preheated 425F oven for 10 - 20 minutes (Depending on whether you let the sauce cool or not first), with a few extra minutes under the broiler to brown the top. For a blue cheese sauce bring 5oz blue cheese of your choice, black pepper and 1 1/2 cups of heavy cream to the boil and then reduce to a gentle simmer until the sauce thickens and is reduced by a quarter of its volume. Combine with the gnocchi as detailed above. You can use one large gratin dish for baking, or smaller ramekins. I took the gnocchi to a partially French-centric pot luck party last night. Although my French friends weren't familiar with their own brand of gnocchi, I don't think they are going to waste any more time before adopting it as their own. wow! it looks gorgeous and I am sure that it tastes delish as well! Tres beau site, belles photos... On reviendra. Gorgeous! 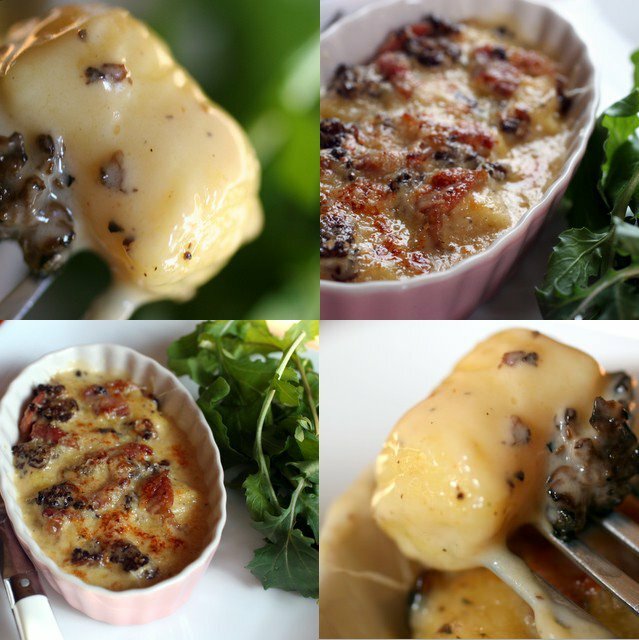 I hadn't heard of gnocchi that wasn't with potatoes, but these look wonderful. What a revelation Sam- in both your forming technique and your unmasking of our favorite little cabbage. Browning them off is my favorite- esp sauced with blue cheese and grapes. And I have to agree that Cream Puffs are the greatest! I am so with you on this Sam--pate a choux is completely underrated and not at all as complicated as some people would have us believe. I always thought when cooking it out on the stove that it smelled a bit like gnocchi, but I have never actually made a gnocchi dish this way before--thank you, I can't wait to try! aach...what do the French know about pasta!!?? They were still boiling it in milk for 20 minutes a couple of years ago! By the way, gnocchi (as pasta) is an Italian word! And I guess panade is gnocchi. Thank you Sam for the recipe. PS: monkey gland, where did you get that thing about boiling pasta in milk? I never heard about it before...Maybe there is an interesting recipe behind the tale? McCauliflower - I am liking the grape idea, thanks! Ivonne - of course - especially Venetian ones, eh? Del - But you don't have to buy it - I make it for you for free! this dough is the subject of my next class. thank you for highlighting its savoury side. It's been ages since I made anything with this dough. I'm happy to be reminded of one of the coolest magic tricks in cooking. These look beautiful. My cooking teacher made this recipe a couple weeks ago and saute'd them in brown butter and sage....mmmmm!! Sam, you've out done yourself this time. These look exquisite! Brilliant.I've never head of gnocchi made this way. I look forward to trying it soon. Looks delicious. Beautiful pictures. Does it have a different taste/texture to the traditional potato gnocchi? 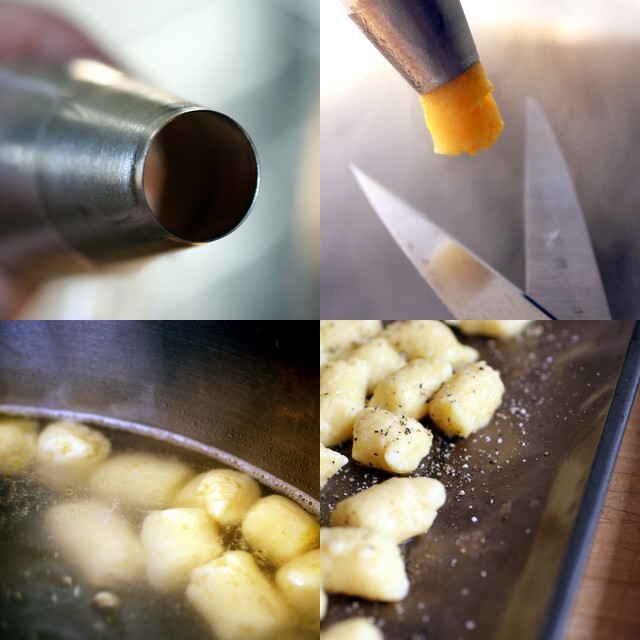 I also find that stopping the cooking of gnocchi quickly in an icewater bath before refrigerating helps. These look amazing! I just saw a Jacques Pepin recipe for Gnocchi Parisienne and found your blog while I was doing a little more research. Your sauces also look fabulous. Will definitely have to give this a try.